MCTi Gloves are becoming more and more popular as the years go on and this year they’ve been a HUGE seller because of the extreme temperatures that have been ravaging North America. I’m not sure where you live or what the weather is like, but where I live it’s been ridiculously cold as of late and I’ve been outside a lot testing new gloves non stop. It’s actually been great because that’s what I love to do. Today I’m going to tell you all about the top three pairs of MCTi gloves that are selling like crazy on Amazon. The 3 pairs of gloves I’ll be talking about today are the……. You’ve probably already read some of the reviews on Amazon so you know that all three of these gloves are getting fairly positive reviews. What I can bring to the table is my extensive experience reviewing gloves. I’m not just a regular Joe talking about one pair of gloves. I’ve reviewed hundreds of winter gloves so I think I can bring a different perspective to this. I’m not sure why they list these gloves with such long tongue twister names. It would be a lot easier if they had a single word model name they used but that’s not the case. To keep things simple I’m going to refer to them in the way I have them numbered. Gloves 1, Gloves 2 and Gloves 3. These gloves are the most popular by a long shot. I think the reason they’ve done so well is because they’re waterproof, windproof and fairly cheap. They come in three different colors. In addition to the grey pictured above they also come in Red and Blue. They’re advertised as skiing or snowboarding gloves but really they’re good for any outdoor winter activity. I found them to be extremely warm as they have a pretty good amount of insulation but this also leads to one of the major drawbacks which is the poor dexterity. They did use a lot of insulation which is great for warmth but I found that the insulation is quite loose inside the shell which is not only bad for dexterity but it’s also kind of uncomfortable. Although they could use some improvement in the comfort department there were some positives. The inside is lined with a nice fleece like material which feels soft and cozy on the skin and it also works well at wicking the sweat away from the body. The exterior is mostly nylon which is great for wet conditions as they’ll keep your hands dry in pretty much any conditions. There’s a cuff buckle which is easy to use even when wearing the gloves. You just give it a tug to tighten them up. One of my favorite parts of these gloves is the little pocket that they have. It’s such a simple little thing but it can come in so handy for things like key’s, cards or money. The overall quality of these gloves seemed fine especially considering the reasonable price. I was half expecting them to be poorly built and perhaps not even get me through the day without showing some wear but that wasn’t the case. I inspected the stitching, the zipper and the velcro and I have to say that they looked to be high quality. Usually I can tell just by pulling at the seems if a garment is low quality so I was happy with these. 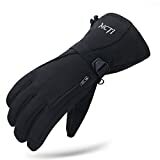 Overall I would say that these MCTi Gloves are a good deal especially on Amazon right now. This pair of gloves is actually very similar to Gloves 1 with a few minor details that really improve the comfort of them. I’m not sure if you can tell by the photo but they tightened these gloves up quite a bit. What I mean by that is the insulation isn’t loose and the shell isn’t baggy at all. They also fit nice and close to that hand so the dexterity and comfort is much better with these gloves. The cost of these is slightly higher than the others but you’re getting a better pair of gloves. The quality is the exact same and they’re still completely waterproof and windproof so you don’t miss out on any of the positives that you get with Gloves 1. Not only that but they also have my favorite little gimmick which is the small zippered pocket that you can put your cards, cash or keys in. So in a sense this all comes down to the cost. Are you willing to pay an extra $10 to get a more comfortable pair of gloves? I know I would be. For me having a more comfortable pair of gloves is really important and it actually makes my day more enjoyable. To shop for these gloves on Amazon Click Here. The third pair of gloves are actually the cheapest of them all. These ones are made for women and they are of the exact same quality as the first two pairs but there are some major differences. In addition to the purple flannel patch that you see above you can also get these with black or baby blue flannel like the pictures below. The first major difference I noticed is the tight cuff that fits around your wrist. This is just a preference thing but it’s there to keep out snow or moisture and it gives you the option of tucking your sleeve under the gauntlet or over it. This pair is also missing the little zipper pocket which is too bad but I guess you have to sacrifice something for the lower price. As for comfort and warmth I would say that they’re the exact same as Gloves 2 so no concerns there. They passed the waterproof and windproof tests with flying colors which I would say is really impressive for a glove at this price point. So basically you’d be choosing these gloves if you really prefer the color options or if you just like the price of them. Either way, they’re good value. All in all I would have to say that these are great gloves especially for the price. A lot of people ask me what temperatures the gloves are made for and I would say that all three of these gloves would be good until about -25 Celsius or -13 Fahrenheit. If you’re thinking about buying some of them I think it’s pretty obvious that my favorite of the three are Gloves 2 but I hope that I’ve given you enough information that you can make your own decision. If you’re looking for a pair of gloves that are battery powered and heated then you should have a look at some of my other reviews. There are actually heated gloves that are in this same price range but to get some really high end heated gloves you would have to pay much more. Thanks very much for stopping by today. If you have any questions or comments about MCTI Gloves please use the field below and I’ll respond ASAP. Well aren’t these gloves nice! Man! MCTi gloves are becoming more and more popular these days, especially among the teenagers. Has to be a fad, but they are fly and stylish never the less. And it’s not even that cold here in North Florida! But when it get’s cold, it get’s cold. My wife would love those purple flannel ones. Do they happen to make these in children’s sizes? Thanks for the question. Yes they do make MCTi gloves in children’s sizes. I would recommend this one here for kids but it depends on the age. If you have a look you’ll see that they have lots of different sizes available. I’m writing to invite you to test AKASO winter gloves and post it in your website. Meanwhile we could offer 30% discount promotion in your article. How could I do that? If necessary, we could offer commission.